Spin bikes are typically more expensive than other indoor cycling bikes, but that’s mostly because they have a more solid construction, and overall they’re built at higher standards. But due to their higher price, many people opt for a used Spinning bike, which in general, it’s not a good idea. 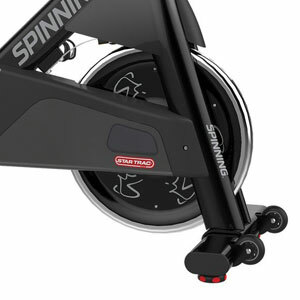 Most used spin bikes that have been part of a gym’s spin class, have a high degree of wear and tear especially concerning their internal components, and may simply fall apart after a few more months of use. Needless to say, if the warranty on a 2nd hand spin bike has already been voided, repairs may be costly. Now, a new spinning bike, although it might not be exactly a cheap exercising machine, it’s pretty much a solid investment. And when it comes to the top models, the Spinning Spinner NXT is definitely one to have a look at. Warranty: Frame 10 years, Parts 2 years, Wear 1 year. The Spinner NXT features an extremely solid frame, with ovalized, flattened tubing for maximum sturdiness. Due to this design, not only that the bike offers superior aesthetics, you can be sure that the seat post or the handlebar post won’t turn sideways during a more consistent workout. Overall the bike is rather heavy, with a weight of 137 lbs (62 kg), but in a spin bike weight is actually important, as it adds to the stability of the bike, allowing you to engage in a really demanding workout. The front base features rubber wheels though, to ease its transport in case it requires storage. Both bases feature adjustable stabilizers. Therefore, even if you place it on an uneven surface, you can still obtain maximum stability. The cycle won’t rock or tip to the side while you pedal. Plus, it won’t damage your floors as the stabilizers are finished with rubber caps. The Spinner NXT does not have an extremely large footprint. There are fitness machines out there that are much larger than this model. For example, the Proform Pro 2000 treadmill takes cca 80″L x 40″W (203 x 101.6 of floor space. This bike’s footprint is 54″L x 21″W (137 x 53.3 cm), and at this size it can fit pretty well even in a smaller room. One last aspect regarding the frame, is its coating. The frame of this Spinner model is zinc coated for superior rust prevention. Its finish is also quite resistant to scratches. 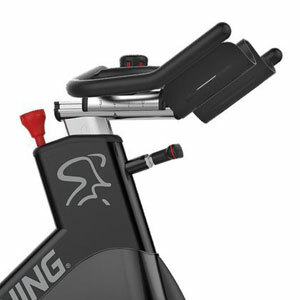 The Spinner NXT indoor cycle excels in micro adjustability. Both seat and handlebar assembly are horizontally and vertically adjustable. The horizontal adjustment bar on the seat features 10 positions, with cca 1 inch (2.5 cm) between each setting. The handlebar assembly has 4 similar adjustment positions. To get a better idea whether or not this indoor cycle can fit you, it was designed to accommodate users between 4’10” – 6’10” (147 – 208 cm), while the maximum recommended user weight is 350 lbs (159 kg). Like in most indoor cycling bikes, the seat on this model isn’t extremely comfortable. It’s a slim, rather hard seat, similar to the ones on race bikes, the seat specific to just about any indoor cycle. The handlebar assembly features a multi-grip design, covered in foam material for a comfortable grip, and to absorb sweat. It also incorporates a double bottle support, made of hard plastic. Adjusting handlebars and seat is simple. The adjustment bars feature sizeable knobs, easy to grip, turn and fix into position. 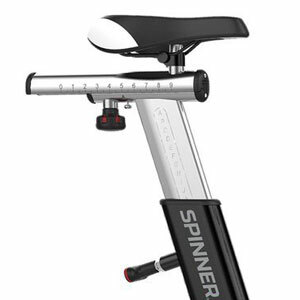 As opposed to the Spinner Sprint Premium which features a chain drive, the NXT model is belt-driven, equipped with a Poly-V Groove belt, stretch resistant and basically maintenance free, supplying a smooth and extremely quiet pedaling motion. This is actually the 5914 model number, the one with a belt drive. However, you can find the same bike but with a chain transmission, and that is the 5916 model number. The bike is equipped with quite a heavy flywheel, weighing 38 lbs (cca 17 kg). The flywheel is perimeter weighted, in order to promote a consistent momentum, eliminating the stair climbing effect which may occur in case the resistance is too tight. The crank assembly is a 3-piece set, with a steel pulley and extremely solid crank arms. Since it’s a commercial grade spin bike, it goes without saying that the crankset is solid enough to support a user at maximum capacity in full stand-up position, and for high intensity climb workouts. The bike’s Q factor is 158 mm, quite narrow, pretty close to the standard Q factor in race bikes. This means that the riding of this bike is really comfortable even for smaller uses. Also, the stress on the knees is considerably reduced, as your feet are positioned on the pedals naturally. Speaking of pedals, the ones included with this cycle are dual sided. In other words, on one side they feature cleats for spin shoes, while on the other side they feature adjustable toe cages. Like most Star Trac bikes, the Spinner NXT model features a friction brake system, involving a foam and leather brake pad. The pad comes in contact with the flywheel in a top-to-down manner. Resistance is adjusted by turning the tension knob situated on the top end of the handlebar frame tube. The tension knob also functions as an emergency brake. By pressing it down you will automatically stop the flywheel. The Spinning Spinner NXT does require some assembly, but the whole assembly process doesn’t call for advanced mechanical skills. The internal mechanisms of the bike are already attached to the frame and assembled in place. The parts that you need to attach to the main frame of the bike are the aluminum posts for the seat and handlebars, the seat and the handlebar assembly, the bikes bases, and the pedals. Since it’s a belt-driven bike, the drive mechanism doesn’t require lubrication. However, the leather brake pad does require lubrication to promote a better grip to the flywheel, and eliminate squeaking. Also, since it’s a friction brake mechanism, the brake pad will wear out after a while and will require replacement. However, leather brake pads typically last several years. Rock-solid frame, able to support users up to 350 lbs. 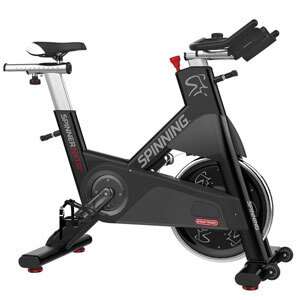 The Spinning Spinner NXT has all the qualities of a commercial grade spin bike. It’s one of the sturdiest high-intensity exercise bikes that you can find on the market at the moment. It’s a bike that can help you achieve your fitness goals, lose weight, tone muscles, build stamina and strength, and maintain a healthy cardiovascular system. It’s not exactly an inexpensive fitness machine, but on the other hand it’s one that can serve you a lifetime.